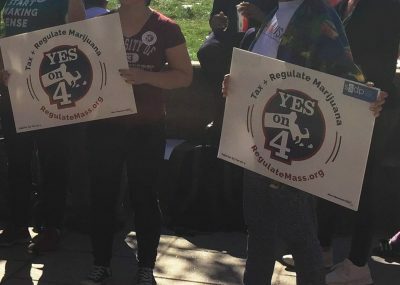 Chanting, “Yes on 4, end the Drug War” approximately 30 people rallied in the center of the University of Massachusetts Boston’s campus Friday afternoon, asking registered voters to vote yes on ballot Question 4, which would recreationally legalize marijuana. Students for Sensible Drug Policy and the Cannabis Cultural Association hosted the rally to support the legalization of marijuana in Massachusetts, according to a flyer passed out at the rally. Moderators Joe Gilmore, the president of SSDP at UMass Boston, and Kamani Jefferson, who’s apart of CCA, invited speakers with a variety of backgrounds to share their personal experiences with marijuana. UMass Boston student Ann Holmqvist, a medical marijuana patient, told attendees that marijuana helped her with many medical complications throughout her life when prescription drugs fell short. Throughout the rally, organizers handed out flyers with the “Yes on 4” logo and a list of each of the speakers’ names and titles. In addition to the Yes on 4 Campaign to Tax and Regulate Marijuana, representatives from the New England Veterans Alliance and the Black Lives Matter movement were also present at the rally. Another speaker, Joe Centrofanti, a student at UMass Boston who was charged with a drug conviction, said he would have to suffer the repercussions of nonviolent decisions he made as a 20-year-old for the next 15 years. Raz Kamal, 18, of Revere, said the stigma Centrofanti referred to prevents voters from being open to the idea of voting yes to marijuana legalization. Nicholas Davis, 19, of Dorchester, said marijuana legalization would benefit the reputation of minorities throughout Boston. “Coming from a low-income area, I believe it would be great for our community and it would definitely take away a lot of stigma from the black community as well and people of color in general,” Davis said. RachelRamone Donlan, 44, of South Boston, and a member of The Massachusetts Cannabis Reform Coalition who attended the rally, said voters should be informed on every ballot question. Longtime marijuana activist and breast cancer survivor KP Owens, 70, told listeners at the rally that organizers were there to speak for their cause because they knew the benefits of marijuana firsthand.